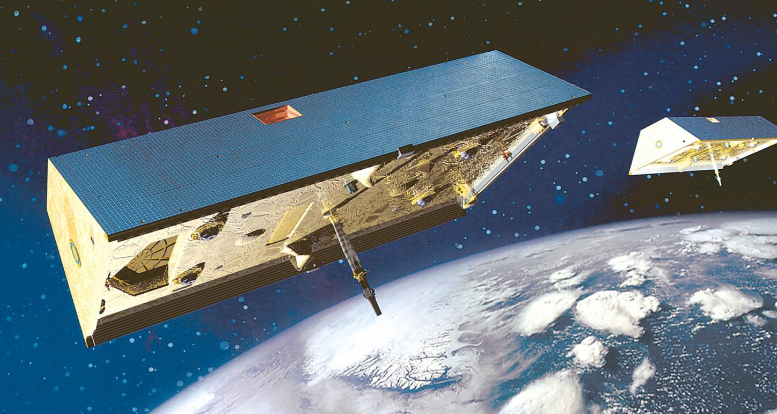 NASA is launching a pair of satellites, collectively called GRACE. The mission of these two satellites is to measure the minute differences in Earth’s gravity between places. GRACE stands for Gravity Recovery and Climate Experiment. These two satellites are extremely sensitive. The two satellites orbit the Earth in tandem, and a small change in gravity can pull them together or push them apart by as little as the width of the human hair. And they are capable of registering that! That allows GRACE to create a gravity map of our planet. See, gravity is not the same on all places on Earth. It is slightly stronger, and slightly weaker on some places. This is because some places have more mass. And more mass means more gravitational force. One way this helps scientists is observing how massive ice masses melt and move. When a massive chink of ice melts over time, a lot of its mass moves, and GRACE can, of course, notice that. When French scientists took a closer look in the old GRACE satellite data (yes, there was a pair before), they noticed unusual readings before the earthquake struck Japan in 2011. This could be a warning in the future, for other, possible earthquakes. COULD! Be the first to comment on "NASA launches satellite to measure changes in Earth’s gravity"